I hung out with a lot of band geeks in high school. They sure loved their toe socks. I saw Injinji socks a few years back and I was curious why you would use toe socks. They offer the benefit of letting your toes splay (spread) while you run. These are great for people who wear wide toe box shoes made by companies like Altra and Topo Athletic. These socks are funny looking and the first time you use them, they feel a little weird. With that being said, the weird feeling went away after about 5 minutes and they are some of the most comfortable socks that I own. There are several benefits of using the Injinji toe socks. The socks are anatomically designed for your foot, covering each toe and allowing your toes to spread out as they naturally want to. Normal socks keep your feet restricted. While you might not feel that this is a big deal, give the toe socks a try and you will realize what I am talking about. You will gain stability and feel more comfortable as your feet learn to spread out. They are great for people who get blisters. By having no skin on skin contact between your toes, you eliminate that point of friction which can cause blistering. Each sock is made of moisture wicking material and has seamless toes. They have a mesh top for more breathability, an arch support band, and an enhanced cuff so your socks don’t slip down. 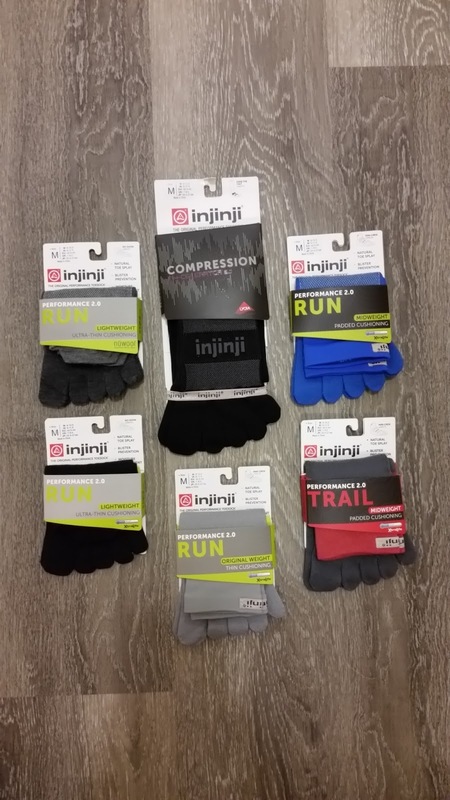 What are the different running socks Injinji offers? Injinji offers shoes with different lengths and material types. First I will talk about the materials. COOLMAX Fiber is a special fiber that provides superior moisture control and comfort. This is the most moisture wicking material that Injinji uses. 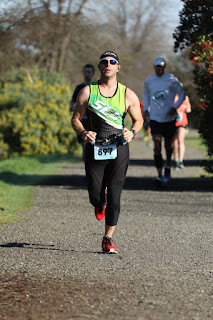 Most of the socks that I have tried from Injinji used the COOLMAX fibers and I really like it. My feet never felt wet and I have never had a blister while wearing Injinji socks. 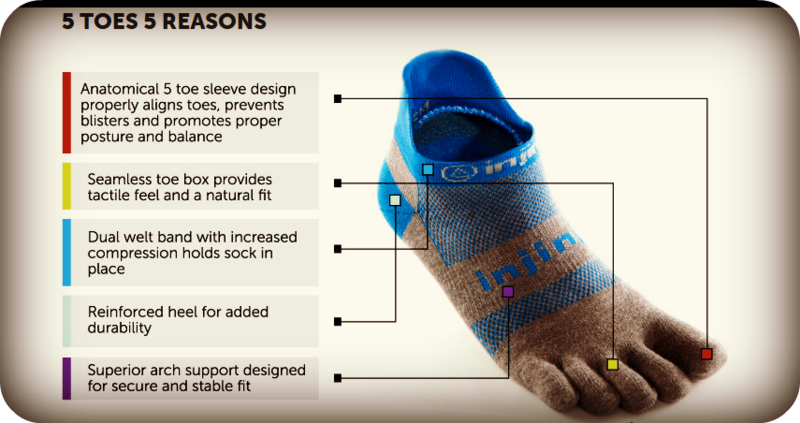 Nuwool is Injinji’s version of merino wool made from the finest wool Australia has to offer. It is spun tight to provide superior durability and prevent itching. Because it is merino wool, it provides maximum temperature control, keeps odors at bay, and keeps your feet dry. 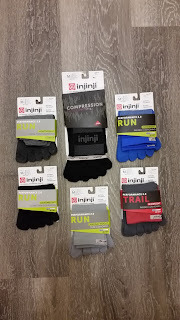 Injinji offers 6 different sock lengths and a compression sock, although I have only tried 4. They have PED, No Show, Micro, Mini-Crew, Crew, and Over the Calf. I also tried the No show, Micro, Mini-Crew and the compression socks, which is an over the calf sock. It is always a personal preference on how much cushioning people like in their socks. Here is more good news for you. There are three sock thicknesses to choose from. The Performance Lightweight sock is ultra-thin, featuring a light and breathable mesh top for maximum ventilation. This sock is ideal for those who want as much ground feel as possible. The Performance Original weight sock is not too thin, not too thick. 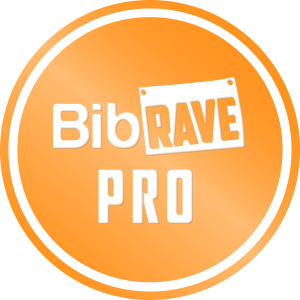 It is great for everyday use in any shoe, climate, or terrain. It’s a great go-to sock for sport and casual use, and I do use it for both. The Performance Midweight sock provides additional padding from the heel to the toes. It features a honeycomb design on top of the foot for added breathability and a light compression for proper fit. If you have sensitive feet and prefer more sock protection you’d like the Midweight. I love my Injinji socks. My favorite ones are the Nuwool mini-crew. They are so comfortable with the soft merino wool. Injinji socks are in my top 3 for running socks and I probably have about 10 pair now. I use them on runs as well as just running errands. If you haven’t tried them, you definitely should. Buy them at the Injinji website, Amazon, or click here for your local dealer.